Every May, this collaborative high school ensemble comes together to prepare for the Iowa City Jazz Festival. Directed by Rich Medd and Ryan Arp, the band is composed of students from Iowa City High School and West High School in Iowa City. For 20 years, this group has served as of one of the signature elements of the Jazz Festival’s commitment to education outreach. 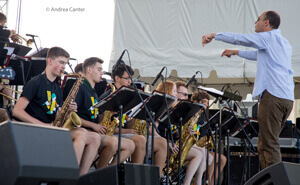 The deep immersion of students in jazz over the summer not only strengthens their musical growth, but builds a strong bond between the programs at the two schools.